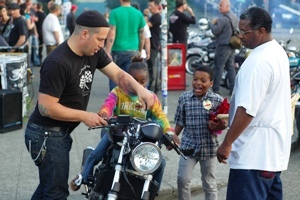 Once a month in Seattle's working-class Ballard neighborhood, motorcyclists gather for Backfire Moto, the Northwest's largest — and most casual — café racer ride-in. What started as a small event now draws hundreds of participants, and up to 500 riders arrive from Seattle and elsewhere during the summer months. Backfire was started by Sean Dunlap, Sean Westlake and Todd Werny, three best friends who have been riding, wrenching and organizing café racer events in the Northwest for over 20 years. "We just wanted a simple event where we could feel at home, hang out, crank our favorite punk rock and check out some cool bikes," says Werny. "Maybe have a beer, smoke a cigar, talk shop and go home in time for work the next day." While all types of riders and bikes are welcome, Backfire is officially a café racer, rat bike and vintage motorcycle night, with scooters and mopeds represented in small numbers. "This isn't about chromed cruisers and trailers or brand new sportbikes," Werny says. "It's a ride-in for the large number of riders out there who don't relate to or fit into the standard bike nights." Visitors are just as likely to hear the bark of small-displacement rat bikes as the irregular pulse of an oil-soaked Excelsior. "Obscurity, modification, rust, dirt, and style are what we hope to see at Backfire. The point is to bring together the overlooked and less celebrated genres of motorcycles that deserve a spotlight." Even among its organizers, Backfire's atmosphere encourages diversity. "We're still pretty much café racer guys, but the night has helped us learn to respect much more than that. It's all about having fun doing what you think is cool. If someone is focused on something else, that's great, too." In an age of specialized and occasionally intimidating motorcycle gatherings, Werny takes great pride in its accessibility, positivity and friendly atmosphere. "It's great to know that we've created an event that brings a lot of cool people together each month. People are there to socialize and network and make new friends. There's a free BBQ grill, no vendors and women feel comfortable riding out, too." It's not just a social event either, Werny says. "Keeping a vintage bike on the road isn't easy, and Backfire is a great place to network and learn from others in a casual friendly atmosphere." 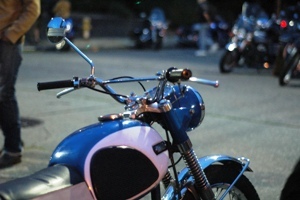 What of the rowdiness that is sometimes associated with outsider motorcycle gatherings? "We've been very fortunate to have had no fights, very little drama, only a few small accidents and just a couple parking tickets. People drink responsibly, too." And what's the best part about organizing Backfire? "We get to see all our friends and all the cool bikes just like everyone else. It can sometimes be a lot of work, but we also have a lot of fun." Then Werny laughs. "And you'll definitely never hear us play "Born to be Wild." Weather permitting, Backfire happens on the third Wednesday of each month, with 2013's season opener scheduled for March 20th. For more information, visit www.backfiremoto.com.